Each of the ten women portrayed in Susan Steinberg’s documentary, Mirrors to Windows, has a unique story to tell about her emergence and establishment as an artist. We share their lives; in the studio, in the office, at the gallery, in the past with family photographs and videos; and listen to their reflections on the evolution of their careers. Mirrors to Windows is a pleasure to look at, a cleverly composed ‘living’ collage of real life and artistic experiences, which contrast, complement and fit almost perfectly together, like pieces of a mosaic. It is a work of moving art, far from a ‘fly on the wall, let the camera roll’ documentary. There is skilful, benign contrivance by the production team, well-crafted editing and fluid shifts back and forth in time, for example. The music – classical, jazz and electronic – enhances the poignancy of the film. Steinberg stays in the background, acting as a facilitator, gently prompting each woman to reveal and ponder. It isn’t surprising to learn that she is training to be a psychotherapist. She radiates calm and candour; she is modest about her achievements as an Emmy award-winning producer and director, whose work has been broadcast internationally and screened at major film festivals. She has tackled a diversity of subjects, including Edward Murrow, an important figure in American broadcast journalism, Paul Simon, the singer and songwriter, the search for gold in the American West, the American novel and the history of Rock ‘n’ Roll. Steinberg had always wanted to make a film about creative women. After making a ‘short’ film featuring Charlotte Hodes, one of the artists in Mirrors to Windows, she determined to ‘make a big film about women, art and life’. It took four years, from casting to final production. An original list of 150 women artists was whittled down to those who could express their feelings about the relationship between their lives and their work in a meaningful context. I don’t really think of them as portraits. I can manipulate them to look like how I want them to look like and have my face at exactly the right tilt…I don’t have to shout at anyone as well for moving, and I can change things. I don’t think they really look like me. Goldsmiths had quite an alpha male vibe going on, and I actually came from textiles. I swapped courses, very female, all female… I had to quit and reapply because the fine art people don’t consider the textile people artists. I dug my heels in and I managed to get in. I mean you have to have self-belief, don’t you? Some of her work could be described as ceremonial. Memorial slabs adorned with wreaths and ivy, made from newspaper stained with blood, tea and coffee spring to mind. ‘My life is based around my work,’ states Alice Anderson, who grew up in Algeria and France. She used to make films; now she concentrates on sculpture. Alice winds copper wire around objects, which look mummified. One assemblage of objects includes a dummy’s head, a child’s guitar, a tool and a moustache shape. Charlotte Hodes is a painter, ceramist, and creator of vibrant, colourful collages of silhouettes, filigree and floral compositions, which look as if they are about to come to life. Hodes’ revelations will resonate with many women. The first time I started collaging was after I’d had children. I thought damn it…now my creativity was going into the children… I became much more openly sort of aggressive about it. I had very little time in the studio. I would rush into the studio and want to close a door and think, oh, I want to do some work, and what do I do? And it was so difficult and challenging and frustrating. And I didn’t know what to do, so I started cutting up my drawings… lots and lots of drawings, drawings from drawing books, drawings that were lying around, pieces of paper, old etchings… It was a kind of a desperation. the British Museum was doing a big show of Cleopatra and they asked me if I’d be interested in doing something…I had the idea that Cleopatra isn’t about her head or her beauty in that way. It’s the stance; it’s the way she holds herself, the proudness; but it’s also the willingness to show a certain vulnerability, which is so feminine. There’s no head, because for me modern woman or beauty or power isn’t about the head; it’s about the way you hold yourself…the way you believe in yourself. Susan Collins is the director of the Slade School of Fine Art. She works with digital media, mostly in response to sites and situations. When Collins was a student at the Slade, arriving for her assessment with reams of printouts of drawings – digital media enable drawings to be saved and remodelled on the page – people asked, ‘but is it art?’ Years later Collins helped to establish electronic media study at the Slade. Ageing can be a relief in an artistic context, reveals Almuth Tebbenhoff. Maliheh Afnan was born in Palestine to Persian parents. She now lives in England. Her work includes portraits of imaginary people and patterns on paper and other materials with images resembling letters. She patiently explains why she lays gauze over the text, which is to evoke the idea of veiling interiors, what is inside human beings. Rose Wylie appears as the essence of impishness blended with unpretentiousness; these senses infuse her work. Her oeuvre could strike one as improvised drama. She features people and objects, boldly, hugely and simply drawn, sometimes with words floating in the background. Her late husband was a painter; long ago they agreed that she would cook the supper for the family, put her painting on hold, and he would paint. Hopefully Steinberg will make more films featuring intimate and frank portraits of contemporary women artists. The tender realism of her work deserves a wide public. Mirrors to Windows is available as a DVD. It is also available for screening. Contact sdsprodteam@hotmail.co.uk, for further information. Mirrors to Windows was screened on International Women’s Day, 8 March 2015, at the Royal Academy, and ‘sold out’. In June, it was also shown at the London College of Fashion (where Jenny Kingsley viewed the film) and sold out. 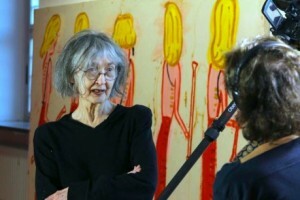 The photograph features the artist Rose Wylie talking with the director Susan Steinberg. © SDS Productions.